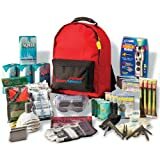 Grab n Go 3 Day Deluxe Emergency Backpack Kit - 4 Person. 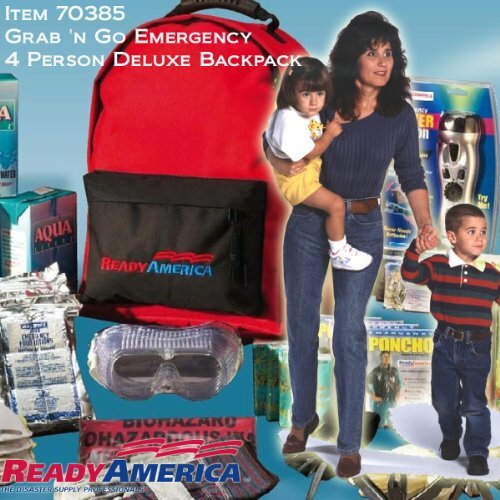 The Grab n Go 3 Day Deluxe Emergency Kit (4 Person Backpack). Nowadays with governments advising us that we should be self-reliant for at least the first 72 hours after a disaster, its absolutely essential that we have emergency supplies at our disposal. Thats why the 3-Day Deluxe Emergency Kit for a family of four is a must have. It contains all the life saving supplies and more that a family will need to survive for those crucial 72 hours. Unique to the Deluxe 4-Person Emergency Kit are three extra items Emergency Power Station, 10 yards of Duct tape, and Multi-Function Pocket Tool with pliers. The Emergency Power Station is a four-function hand-crank unit that features a flashlight, AM/FM radio, cell phone charger and personal alarm. One minute of cranking produces either 30 minutes of bright light, 2 minutes of talk time on a cell phone, or 15 minutes of radio. The Multi-Function Pocket Tool with Pliers includes: screwdrivers, pliers, file, wire snip, bottle opener, and knife all in one. Make sure you have one in your home, office, or car. Your family will thank you. 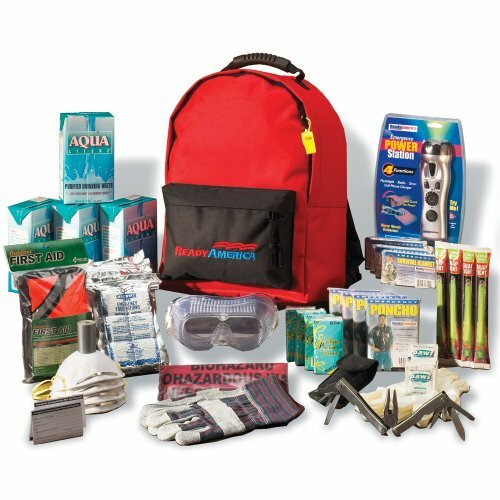 Emergency Kit Contains: 4 2400-Calorie Food bars (5-year shelf life) 4 Liter Sized Waters (5-year shelf life) 4 Emergency ponchos 4 Survival blankets 1 Emergency Power Station 10 yards of Duct Tape 1 Multi-Function Pocket Tool w/pliers 1 First aid kit (107-piece) 4 12-hour emergency light sticks 4 Pairs of nitrile gloves 4 Pairs of safety goggles 4 NIOSH N95 dust masks 4 Packs of pocket tissues 1 Pair of leather work gloves 1 Emergency whistle 12 Pre-moistened towelettes 3 Biohazard bags 1 Four Person Backpack Kit Dimensions: 12"L x 9"W x 16"H Weight: 19.3 *Actual contents may vary from what is shown in photo.